Denmark is the country where Scandinavia begins. It is changing a lot over the centuries. Once popular for its fierce warriors, the Vikings. However, it’s now a peaceful modern country where innovative architecture shares space with medieval buildings. You’ll see picturesque fishing villages that trace their heritage back to the Vikings. An overview of the places to visit in Denmark. Copenhagen marks 1st in the places to visit in Denmark. Many travellers will begin their visit to it as it is the country’s largest city and capital. However, the former Viking fishing village is now the cultural and financial centre of the country. Most visitors come to Copenhagen for two things. Firstly to enjoy Tivoli Gardens(Theme park) and secondly to see the Little Mermaid, a bronze statue based on a Hans Christian Andersen fairy tale. Copenhagen has a horizontal landscape marked with some neat castles and medieval churches. 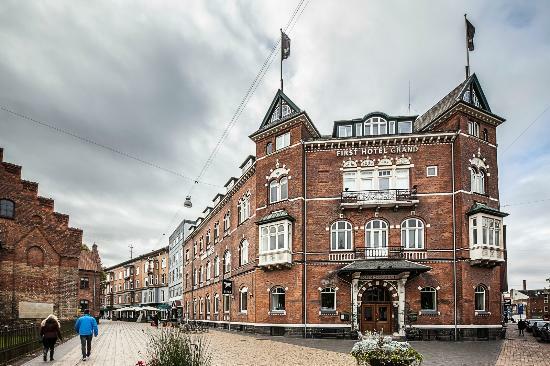 With 330,000 people, Aarhus is the second largest city and places to visit in Denmark. Aarhus is famous as a trade centre for centuries and also for its vibrant music scene. The city annually hosts an eight-day international jazz festival. Aarhus is a European Capital of Culture for 2017. Further, the oldest best-preserved houses are present in the inner city. Dominating the entire cityscape is the 13th century Aarhus Cathedral, the city’s longest and tallest church. An Old Viking castle Funen Village Museum, which revitalises the life during Andersen’s years. Funen’s Abbey, one of Denmark’s ancient art museums. 11th century Saint Canute’s Cathedral church. Bornholm is an island in the Baltic Sea proximate to the shores of Poland and Sweden than Denmark. It is popular for its arts and crafts items, especially glass and pottery. The island serves home to several towns with picturesque windmills and numerous medieval churches, four of which are round. Further, the island is noted for its outstanding scenery from craggy sea cliffs and forests to verdant valleys and beaches. Here, you’ll find medieval fortresses and sun temples from the Neolithic age. Elsinore, also popular as Helsingør, is home to one of the famous castles in the world. Kronborg, the context for Shakespeare’s Hamlet. The play is conducting over here from 80 years. However, the former medieval fishing village is present since the 15th century, though a fortress and a church surrounding by convents dating a century back. Further, it’s now a bustling port city. A 2012 statue, Han, in the harbour is considered the counterpart of Copenhagen’s Little Mermaid. Top attractions include the castle, the maritime museum, and the statue to Holger Danske, a legendary character who warred with Charlemagne. Finally, post knowing such history of Denmark it is sure it would get to your nerves & you’ll be ready to explore it. So don’t waste your time anymore Get Set & Go.